18-wheeler crash victims often feel stunned and overwhelmed, resulting in them making mistakes. It helps to consider ahead of time what you want to do and avoid doing if you end up in a truck crash and have to take immediate next steps. Those steps are essentially five: call 911, get medical care, take photographs, contact your insurance carrier, and contact an attorney. It is actually quite smart to contact an attorney as soon as you have contacted the police and prior to contacting your insurance provider – to get advice before speaking directly with them or the police; either way, those are the key steps. The first thing you want to do is get the car to the side of the road and put on your hazards. You need to call the police right away if there is damage to either car or if someone is injured. You should each have the other’s insurance information. Even if you think that you caused an 18-wheeler accident, it is smart to phone 911 so that everything is recorded. Sometimes people do not want to phone the police, but it is important because you need that document of the incident that the police report provides. Police can also make the situation safer if there is a threat of violence from another driver. You need visual evidence of what happened, again so that you have a full record of the situation to back up any claims you may make later. Take many photographs. You want to have full documentation about everything related to the crash, so not just the outside but inside of the vehicles, as possible. You also want to get pictures of all the people involved in the truck collision. Get pictures of drivers, passengers, and bystanders. The photos are evidence of the people you say were there, the road conditions, and other specifics. You can keep a disposable camera in your glove compartment for accident preparedness if you do not have a smartphone. Just be sure to get one that has flash. Collect as much information as you can so that you are not completely reliant on the police report. The top piece of information that you want is the name, driver license number, phone number, and address of drivers. 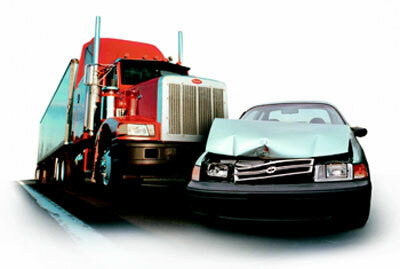 Make sure you get insurance details for all drivers involved in a semi-truck crash. Ask the other driver if you can see the card. Write down the name on it exactly as it is printed, as well as the policy number and the carrier name. Get contact information for passengers too. You also want to be able to follow up with the police as necessary – so jot down the name and number of the officer who is filing the report. Also record the report’s case number if it is available. The first priority following a crash is ensuring everyone is safe. The second priority is avoiding financial fault for an 18-wheeler crash. The facts are the facts. However, you should not assume responsibility. The other person could be driving without a license, or they could be on drugs or alcohol, or you could be unaware of the state’s laws. For those reasons and others, full information is needed in order to objectively determine fault. Talking about injuries is also not a good idea. For instance, someone might ask if you are hurt, and you might feel at the time that you are not. The problem is if you say that you are OK, the other person can use that against you later if a problem arises. If you can validate your perspective through the eyes of another person, your long-haul truck accident case is much stronger. Be sure to get names and numbers of eyewitnesses. You also do not want to sign any documents except for anything that might be required by the police. Related to the fifth point above, you want to be very careful about this issue of whether you are reporting yourself as “OK” following the accident. Many injuries do not surface until days or even weeks after an 18-wheeler crash. For example, post-traumatic headaches can arise, and treatment can be long-term. Accept medical attention, and do not report to anyone at the scene of the accident that you are all right. Are you concerned about how to respond to a truck accident, or have you recently experienced one? At Farrah Martinez Law Firm, we seek maximum compensation for clients who have been injured in 18-wheeler or truck accidents on the road or at work. Don’t wait another minute.